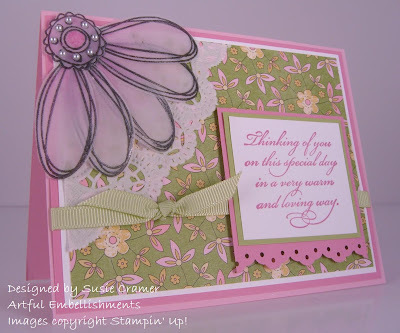 I have another card to share with you today that was created by Susie. She is such a sweetie to put all of these cards together for me while I'm enjoying our family vacation. What a fun use of the Pick-A-Petal set! Isn't fun to take a set that you've had sitting on your shelf and do something completely different with it? I always feel so frugal when I can use a favorite stamp in a new and unusual way. Susie did want me to mention that she saw this layout on Splitcoast - I'm not sure who the original creator was, so if you know, feel free to leave me a comment! 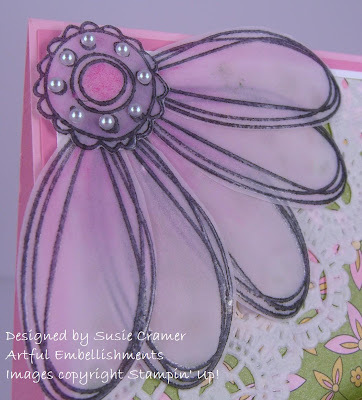 You can see more of Susie's work at her Etsy shop, Artful Embellishments. We have only a couple of days left at the lake. :( The last couple of days have been sunny and hot - perfect for lots of swimming and boat rides. We are all going to be very sad to leave.